On an otherwise uneventful day in December 2006, John Dickson received a wrong number that would change his life in ways he never could have expected. In an attempt to reach Santa Claus at 1 (800) SANTACLAUS (726-8225), a young boy accidentally dialed Dickson’s business line at 1 (800) SANTABARBARA (726-8222). Instead of declaring the child had reached the wrong number, Dickson decided to play along; he listened to the boy’s Christmas-gift wish list and then let out a merry “Ho! Ho! Ho!” before the child hung up. With the deluge of calls coming in from all corners of the United States, Dickson invariably needed help. So he recruited volunteers, who signed up for two-hour shifts to answer phone calls. “We had 100-plus volunteers from all walks of life,” Dickson said. 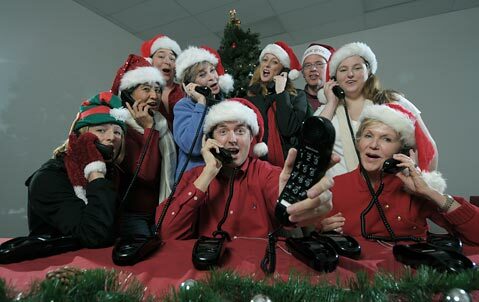 Now in its sixth year, the Santa Claus Call Center is a fixture in Santa Barbara (if not the U.S.), and the accidental Santa is rounding up his elves once again. “We have amazing volunteers,” Dickson explained. “Cuca Acosta holds the record for clocking the most hours every year.” And with 30-plus hours under her belt (in a five-day stretch, mind you), Acosta is one of the few bilingual elves who can receive calls from Spanish-speaking children.